I’ve viewed the theme demo. 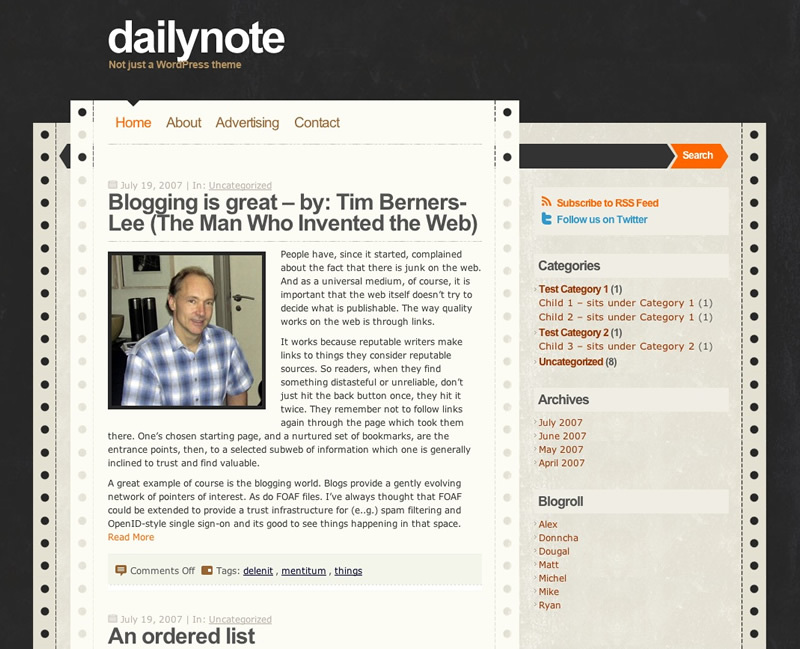 As you mentioned and so far I figure out that this theme has widget custom Daily Note Template is SEO friendly? Great Template. I like it’¦Thanks for sharing..
Love the way this theme really showcases the images. Beautiful. Thanks for sharing. I seems the theme does not have the option to have multiple pages (numbered) in the different articlepages. Can you tell me how to fix that or is just like that? thanks about the beautiful Theme. I whant to show the profile’s picture on the comments post. thanks for your very nice theme. Unfortunetaly, I can’t change the header and I don’t see how it’s working or if it’s Logo changer. If someone can help me..
Outsanding theme. thaks to share. Really a beautiful theme. Thanks. I like it so much. Thks. Very nice template. I love it… Thanks buddy. Thank you great article, i will publish that in my homepage, well done. Great Theme. But there is a really big problem in that. After a few articles, the site just stops in their length. When I write a new Article, one of the older ones on the foot of the site will be erased. Is there a way to have multiple pages? That is very urgent. Without a fix nobody will be able to use this theme for longer. Please help. okok, I just found out the mistake of my previous comment why the blog stops after a few entries. The number of Articles on one site was set to 10. But whats about multiple pages? is there a way? Does anyone know how to change the twitter link on the sidebar from DesignDisease to my personal twitter link? Also, is it possible to rearrange the bar or change it? The widgets don’t allow for it. nice, but it do not show next and previous page. is there any patch please? thank you much very nice! simple theme … i like these…. This is amazing theme. The best thing is simple and beautiful. This is my first visit on your blog. i have bookmarked your blog to visit again in the future. this is such a interesting blog. keep posting.. Thanks for sharing such a wonderful theme. Can i install or copy with its codes to my website? Is that possible? Theme is really looking good. It can be use for many purposes like for blog, micro websites even. great article sir. i like it. thanks for sharing this, your all posts are awesome.